This NAS has a quad-core Cortex-A15 processor, up to 8 GB RAM, four Gigabit LAN ports, multiple encryption and virtualization features, as well as support for up to 21 drives(by attaching two expansion enclosures). 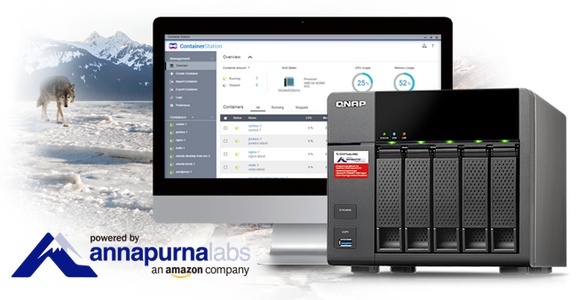 QNAP Systems announced yesterday the release of a new business NAS, namely the 5-bay TS-531P. According to the company's Product Manager Jason Hsu, "The quad-core TS-531P is energy efficient, features a full spectrum of business applications, and provides an ideal storage base and 10GbE readiness for SMBs at budget-friendly prices." This NAS supports Container Station, which allows to operate Linux systems and download various apps from the Docker Hub Registry. Container Station will soon support the Online Document app, but currently this one is still under development. With the help of the 8-bay UX-800P and 5-bay UX-500P, the QNAP TS-531P can be scaled to support no less than 21 hard drives. This new NAS is available in two versions, one with 2 GB RAM, and the other one with 8 GB. Pricing details and other information can be obtained from QNAP authorized resellers. The TS-531P NAS is now available. For further details on other QNAP NAS solutions and more information on where to buy, please visit www.qnap.com.